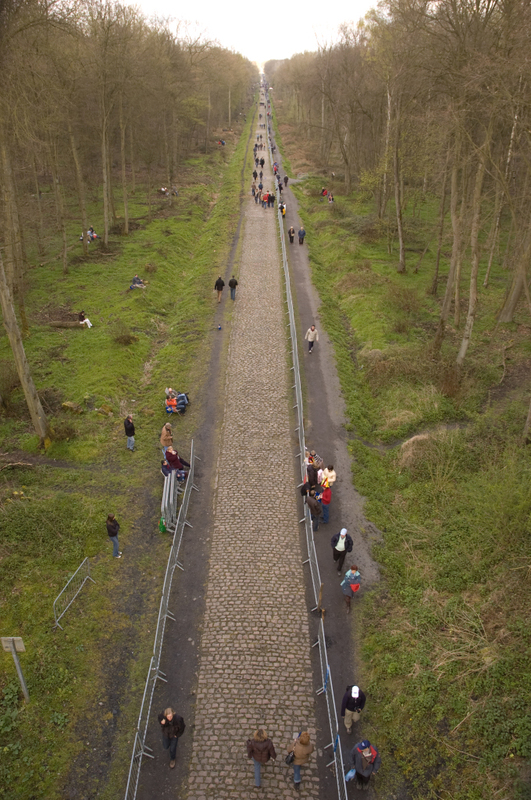 The 2.4 km cobbled road first used in Paris-Roubaix in 1968, and quickly became the race’s symbol. The road was proposed for the “Queen of the Classics” by former professional cyclist Jean Stablinski. Stablinski had a special knowledge of Arenberg. Before he even turned professional he worked in the mine at the southern entrance to the Forest. He lived in the department all his life. He was born just north of Arenberg and later lived in Valenciennes, just to the south. He knew the area as well as anyone, so the organizers turned to him when they saw the teeth being pulled from their race. 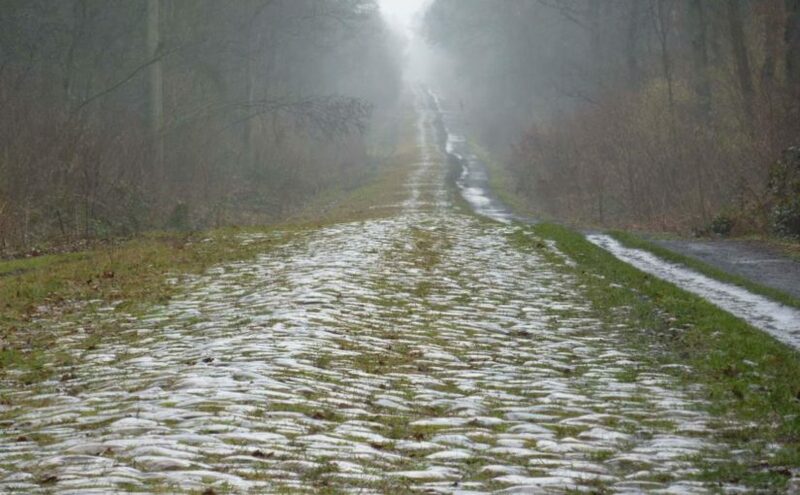 He knew where there were hundreds of terrible cobbled stretches deep in the countryside, including the Tranchée d’Arenberg, which were to the east of the original route. Sadly, maybe ironically, Stablinsky never won the Paris-Roubaix. Stablinski died after a long illness on 22 July 2007. On 7 April 2008 he was remembered by a memorial beside the Wallers-Arenberg road he had introduced to Paris–Roubaix. The memorial was made in blue limestone from Soignies by the sculptor Michel Karpovitch. — Franco Ballerini, 1998 Paris-Roubaix winner. The passage was closed from 1974 to 1983 by the Office National des Fôrets. Until 1998 the entry to the Arenberg pavé was slightly downhill, leading to a sprint for best position. This was as a result of triple Paris-Roubaix winner (1996, 2000, 2002) Johan Museeuw‘s crash in 1998 as World Cup leader, which nearly cost his leg to gangrene. The route was reversed in 1999 to reduce the speed. In 2005 the Trouée d’Arenberg was left out, organizers saying conditions had deteriorated beyond safety limits. Abandoned mines had caused sections to subside. The regional and local councils spent €250,000 on adding 50 cm to restore the original width of three meters and the race continued using it. Gaumont spent a month and a half in bed, unable to move, and was fitted with a 40 mm section fixed just above the knee and, to the head of the femur, with a 12 mm screw. Crashes happen in Trouée d’Arenberg. The Trouée d’Arenberg is rated with 5 stars, means the cobbles are extremely difficult to ride because of their irregularity. So many fans and tourists have taken away cobbles as souvenirs that the Amis de Paris–Roubaix have had to replace them. Amis de Paris–Roubaix: es Amis de Paris–Roubaix – the “friends” of the race – is an enthusiasts’ group founded by Jean-Claude Vallaeys in 1983. It is based in France but open to members all over the world. Its aim was to find enough stretches of cobbled road to preserve the nature of the race.